The Challenge Program, Inc. 18 and Living the Dream - The Challenge Program, Inc.
A day where you get out of the office and get to meet business partners and students is more than likely going to be a good day. 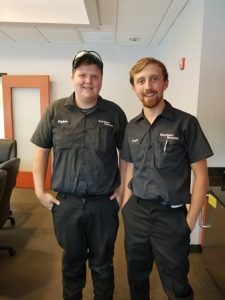 When The Challenge Program, Inc. (TCP) found out that Gardner Denver was hiring two graduating seniors, Stephen and Travis (pictured left) from their partnered school Admiral Peary AVTS, Sara, the Senior Program Development Manager, set up a meeting with the business and students for the end of June. Gardner Denver, one of the country’s leading global providers of engineered solutions to operational challenges, based in Texas, has an office in Altoona, PA. The company manufactures industrial compressors, blowers, pumps and fuel systems. So when an intern, who studies communication and has no idea what a compressor even does, was given the opportunity to go to the company and conduct an interview with the students, she knew she had some planning to do. It was a little intimidating walking through the doors of this large building filled with experts on turning nothing into something. The building was spotless inside and it was the perfect temperature that you dream of walking into on a hot summer day. You are greeted by every person you pass by with a smile and, almost feel like you work there yourself. As a college student who interacts with 18-22-year-olds on a daily basis, it was difficult to not expect the two young men to be uninterested in the interview process for a feature story. However, it was just the opposite. It was impressive how immersed in their work they were and how happy they seemed while asking them the questions about their goals. Stephen Parzatka won the STEM award as a senior at Admiral Peary AVTS. “[Winning that award] was great. I really put my all into it,” he said. Along with financial incentives in 5 award categories, TCP provides students and businesses a chance to connect with one another. Gardner Denver has taken advantage of this benefit by hosting students from Admiral Peary AVTS tours of their Altoona facility for the past 2 years. Stephen and Travis remembered how the tour sparked a buzz in their classrooms. Travis recalls, “Our teacher was in love with the place. He said it was so clean you could eat off their shop floors.” Travis and Stephen began researching the company themselves and took the initiative to contact Gardner Denver and find someone who would talk to them about a job. Travis and Stephen describe The Challenge Program as “motivating” and “rewarding.” Their advice to students attending The Challenge Program, Inc.’s assemblies this coming fall is to listen, take advantage of opportunities, and to know that there are jobs in the area. Travis adds, “The program was successful in connecting us to the business. Find something that motivates you. Have fun learning and put your mind to it.” The maturity level and kindness of the two young men were amazing considering most people their age have priorities that are much less developed. This just shows what motivation and personal connection can do for students. After the interview, everything felt refreshed; as if seeing those young men so happy and proud made all of the hard work that goes into the program worth it. These are the things that most people are unaware of about the Challenge Program, Inc. They really do have an impact on students’ lives and seeing the results of that first-hand is almost magical.